Picking up barbells and doing curls while keeping your back and elbows locked in position will be such an ease with this device. Yes, you will notice that you work the biceps like a pro. Our arm isolator blaster bar will do the trick. This splendid will do the work by isolating your biceps, helping you to lock your elbows in place. It's basically the same as a preacher bench, but of course, it is way super worthy of less space and cash. 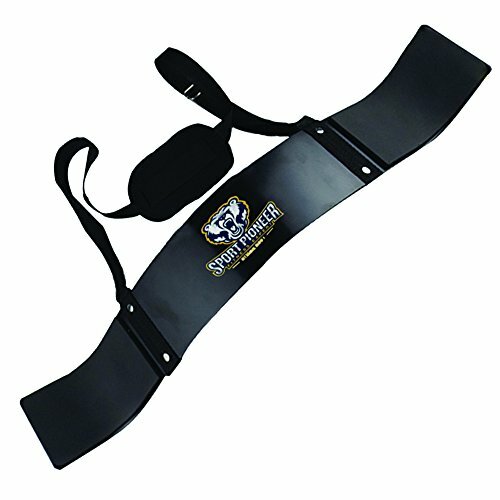 The sturdy aluminum and webbed nylon belt and contoured plate are built to last and have been carefully designed with adequate padding to support your neck and elbows. Call in super easy to use and see how it works like a charm! Buy TOSSFIRE (TM) bicep bomber to build your arm muscle now by clicking "ADD TO CART". Start making a difference to your daily workout! THE EASIEST WAY TO BLAST THOSE BICEPS -- The trick to successfully shape your biceps is keeping your back and elbows locked in position while doing curls. This bicep blaster allows you to do just that! It isolates your biceps, effectively forcing them to do all the work. It's basically the same as a preacher bench, but without taking as much space and cash. EXTREMELY STURDY WEBBED NYLON AND ALUMINUM - The thick gauge plate is made of premium aluminum that will not bend easily. The strap is thick, durable and firmly screwed to the plate so it will not loosen or falling apart. This arm curl support is made of webbed nylon which can withstand weight up to 1000 lbs. This equipment is simply built to last. If this bomber bicep is not durable enough, feel-free to return it within 30 days! EFFORTLESS USAGE BICEP BUILDER - With our arm and bicep support you can do some curls anywhere you want. Just put the strap around your neck, position the contoured plate in front of your torso, and never let your shoulders sway when you pick up that barbell. Now, you can conveniently proceed to do those curls! GRAB YOURS NOW - Add TOSSFIRE (TM) to your cart now for the ultimate bicep workout and body building! Also, we have some offers for buy 3 get 10% off, buy 2 get 5% take this great offer before is over. Order yours now! If you have any questions about this product by TOSSFIRE, contact us by completing and submitting the form below. If you are looking for a specif part number, please include it with your message.